'What Happens Next' to Cosmic Rocker Joe Satriani? An All-Star Lineup! Cover for Joe Satriani's new record "What Happens Next." Expected to be released on Jan 12, 2018. "Guitar god" Joe Satriani's upcoming solo album, "What Happens Next," features Red Hot Chili Peppers' drummer Chad Smith and Deep Purple's Glenn Hughes on bass — and after listening to a preview of the record, the rock 'n' roll power can be felt seething out of the speaker. Satriani's solo career, which consists mainly of instrumental songs with a large dose of mind-blowing virtuoso guitar work, has been influenced on a number occasions by space, science and science fiction. His first two records, "Not of This Earth" and the platinum-selling "Surfing with the Alien,"were a sign of things to come for the artist. Other album titles such as "Crystal Planet," "Is There Love in Space" and, most recently, "Shockwave Supernova" continue to display Satriani's fascination with the cosmos. Some of the songs on the albums, like "Redshift Riders," are his attempt at transposing phenomena that occur in the universe into music, according to his book "Strange Beautiful Music: A Musical Memoir." The book was originally released in 2014 by BenBella Books and was updated for the paperback release in 2017. It takes a deep dive into the creation of all of his records. The addition of Chad Smith, who also played with Satriani in the supergroup Chickenfoot, and Glenn Hughes in Satriani's latest effort has amounted to high-octane songs such as "Energy" and "Thunder High on The Mountain," which display the intensity that the legendary trio can attain. But, sadly, for this long-time Satriani fan, Hughes and Smith will not be joining Satriani on his upcoming "G3" tour to support the album in 2018, which features Dream Theater guitarist John Petrucci and Def Leppard guitarist Phil Collen opening for Satriani. Regardless, with a lineup like that, guitar mastery will certainly be on display. The new record is available for preorder on Amazon and is expected to be released on Jan. 12, 2018. 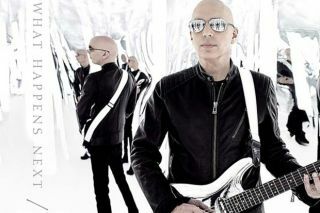 You can go to http://www.joesatriani.com/ to find out more about the tour.